Embark on your journey with a Coast Guard Certified Master an an in water chaperon, educator and photographer. Your tour will run three hours from start to finish and everything you will need is included for one price. You will begin at our full-service tour facility, where you will be educated about the animals in a classroom type setting and receive tips for your snorkel tour to make the most of your day. You will be taught the in’s and out’s of ‘passive interaction’ as this ensures that the animals enjoy the experience as much as we do! You will then be suited up and transported to the dock, where a Coast Guard certified covered pontoon will be waiting for you. This rich estuary will amaze…..birds, fish and wildlife abound! Submerge yourself in the manatee’s world! Finish your adventure by viewing your Captain’s photos back at our facility and be sure to visit our one-of-a-kind gift shop! Our well-informed staff will direct to other local attractions, restaurants and answer of your questions before you are on your way. This encounter with our endangered manatee is done on a covered pontoon and is perfect for all levels of snorkel experience. Don’t miss the boat! 7 days a week, year round! **Remember that once the weather starts to get warm in March, manatee begin their migration away from the springs and become more elusive. It is very important in the warm seasons to have REALISTIC EXPECTATIONS about how many animals you will see, under what conditions and how long it may take to find them. The COLD weather brings them to the area to enjoy our fresh water springs, but once the Gulf temps begin to warm, the manatee become more difficult to find and tend to be located closer to food sources where the water is not always clear. Also, spring brings hundreds of people to the area hoping for a glimpse of these amazing animals…COME EARLY MORNING if you hope to avoid the crowds. We add tours later in the day as capacity demands, but conditions deteriorate as the day goes on. If you are hoping to see dozens of manatee in clear spring water, than a springtime visit may disappoint. If you need more details about what to expect when visiting us in spring or summer, please visit our conditions page or call us anytime! We are always honest about conditions and encourage our visitors to do their research! We meet at our full service Manatee Tour and Educational facility in Crystal River. You will be checked in, and offered complimentary coffee, tea or hot cocoa. Upon tour time, we take you into a classroom type setting where we learn about the animals, the eco-system and watch a short video of rules required by the US Fish and Wildlife. This is a wildlife refuge and it is very important that we fully inform you as to what the rules are and how to behave if you hope to view a manatee up close! We will fit you for a wetsuit, direct you to our climate controlled changing rooms and gather up your group. We take care of transporting you the very short drive to the dock, where your Captain is waiting for you! After your tour, we will drive you back to River Ventures. You can help yourself to coffee and cocoa, use the restrooms and changing rooms, check out the gift shop and view the photos from your adventure! Our boats are US Coast Guard Certified, inspected and stability tested for your safety and are designed to hold anywhere between 6 and 16 swimmers and/or observers. Keep in mind that we control the amount of people on our boats, but we can not control the amount of people on the water. We go on a manatee search and all the tour companies go where animals are found......so after 9 am, especially on weekends, Holidays or during manatee season, the waterways can get very crowded with people. At 6:15 you get out while the refuge is at its quietest and the manatee are still in their most relaxed state. We know it’s early....but it tends to be the best experience for our customers so we don’t mind the wake-up call! Children must be at least 3 to go on the group tours, but younger babies are allowed on a private tour. Children under 18 must be accompanied by an adult, and very young children must understand enough to be calm and quiet in order to not scare the animals away. Children should be comfortable in the water and parents should stay close at all times for safety. We have wetsuits in all sizes and provide snorkel vests and flotation noodles if kids need a bit of assistance staying at the surface without swimming. commitment to be on time and honor your reservation. If you do need to cancel last minute, please contact as ASAP and we will offer you gift certificates with no expiration date or a chance at another tour time. Enjoy the unique privilege that is exclusively ours here in Citrus County Florida by swimming with the manatees in the spring-fed King’s Bay Wildlife Refuge! Crystal River is home to the world’s largest population of endangered manatee during the winter season, and even a small population in the warm months. Having the chance to encounter these curious, gentle giants in their natural habitat is an adventure that your family will never forget! Embark on your journey with a Coast Guard Certified Master Captain and in water chaperone, educator and photographer. Your tour will run four hours from start to finish and everything you will need is included for one price. You will begin at our full-service tour facility, where you will be educated about the animals in a classroom type setting and receive tips for your snorkel tour to make the most of your day. You will be taught the in’s and out’s of ‘passive interaction’ as this ensures that the animals enjoy the experience as much as we do! You will then be suited up and transported to the dock, where a Coast Guard certified covered pontoon will be waiting for you. This rich estuary will amaze…..birds, fish and wildlife abound! Submerge yourself in the manatee’s world! Finish your adventure by viewing your Captain’s photos back at our facility and be sure to visit our one-of-a-kind gift shop! Our well-informed staff will direct to other local attractions, restaurants and answer of your questions before you are on your way. Check out our SUNSET VIP Manatee Snorkel for additional availability on this boat! The semi-private VIP tour is a 4 hour adventure. IT IS MOST IMPORTANT THAT YOU ARRIVE NO LATER THAN YOUR SCHEDULED TOUR TIME!! Our boats operate on a schedule ....and it can be very difficult to deviate from that for a late party. Don’t miss the boat.....please arrive on time! This sleek vessel gives new meaning to the term ‘Bay Windows’! Whether it is just you or a few friends who would like to embark on the manatee snorkel experience there are many options…..This is one of our favorites! 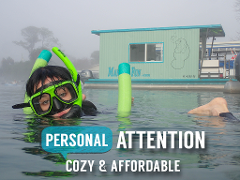 Highly recommended by Manatee Fun staff is our one- of- a- kind houseboat. The large windows fill the cabin with light and provide nearly 360 degree line of sight plus a unique rooftop viewing platform for when the boat is anchored. What an incredible sight! Spacious and heated, ride in comfort no matter how chilly the winter winds blow! Sit on the couch overlooking the Refuge waters, sip on your hot cocoa and feel all your worries melt away!! Wear your bathing suit...that way you are ready for a quick change into the wetsuit. Bring a towel, people will bring these along on the boat. Keep season and air temps in mind. If it is cooler, it is a great idea to bring a sweatshirt, jacket or even a full set of loose fitting clothing to slip on after you get out of the water. If you have young children, this is especially important, be prepared with warm clothes....always better safe than sorry! The water here is always 72 degrees, and for some that is quite chilly! Feel free to bring a bag onboard the boat to keep your personal items, but we HIGHLY recommend not bringing anything of value on board the boat. During warmer weather most people will wear their wetsuits back to the shop and change into their clothes when they return from the trip. Bring what you feel you need, but no worries we will take care of the details! As a private tour you are welcome to bring snacks or a cooler. On the houseboat we provide you with snacks, hot beverages if desired and bottled water, but you are welcome to bring whatever else you would like to bring! individual. In the cooler weather the animals migrate to this area and congregate here for the protection of the warm water springs; when the weather warms they can move about going wherever they want! These are wild animals and we can not control their migration. Manatee spend their lives searching for food, mates, sleeping and playing....it is hard to predict what state they will be in when we encounter them. The early mornings tend to be the best time to find the animals and best chance of seeing them near the springs where the water tends to be more clear. Remember it is very simple, cold weather = many manatee; warmer weather=lower manatee counts and more time looking for these endangered animals. Even seeing a few manatee is a phenomenal adventure! With our private houseboat, you get 4 hours instead of 3 and this extra hour can make a huge difference. One more hour on the water equals more opportunity to view wildlife and create awesome memories! offered complimentary coffee, tea or hot cocoa. Upon tour time, we take you into a classroom type setting where we learn about the animals, the eco-system and watch a short video of rules required by the US Fish and Wildlife. This is a wildlife refuge and it is very important that we fully inform you as to what the rules are and how to behave if you hope to view a manatee up close! We will fit you for a wetsuit, direct you to our climate controlled changing rooms and gather up your group. We take care of transporting you to the dock where your Captain is waiting for you! After your tour, we will drive you back to River Ventures Manatee Mecca. You can help yourself to coffee and cocoa, use the restrooms and changing rooms, check out the gift shop and view the photos from your adventure! This houseboat is a 4 hour adventure. IT IS MOST IMPORTANT THAT YOU ARRIVE NO LATER THAN YOUR SCHEDULED TOUR TIME!! Our boats operate on a schedule ....and it can be very difficult to deviate from that for a late party. Don’t miss the boat.....please arrive on time! keep still as to not disturb their natural behavior. If you have your own gear that you would like to use we encourage you to do whatever makes you most comfortable. If you choose to bring your own gear keep in mind that this is a shallow water snorkel, so advanced diving gear is not needed. We no longer use fins, and they will not be allowed around the manatee. Use of fins can stir up the water affecting visibility, and also can give the perception of chasing. We never need to be faster than the manatee, we remain calm and let them approach us! cold weather we have many in the area and it typically does not take long to find them, but when it gets warm patience is a requirement! 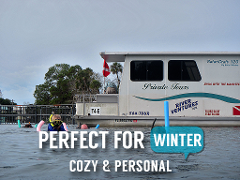 With our enclosed houseboat you will be comfortable on even the chilliest winter day! Please remember that manatees are an endangered species and seeing even one of these majestic beasts is a great privilege. Our tours are conducted in their natural habitat and they are free to come and go as they please. No two days are ever the same, and no two tour times are the same either Weather, tidal influences and time of the year affect the conditions daily and it can never be predicted just how many manatees you will see. During the colder months we have a large concentration, but if there is a considerable warm spell they will become difficult to find. Because this unique eco-system is a prime manatee habitat, we have a small resident population even in the summer. We never guarantee that you will find or encounter manatee and how many you see is tough for us to predict as well. through quite quickly and even if we delay it will not take away from your tour time. Our boats are covered to protect you and your belongings from the elements if you wish to stay dry. If we need to cancel because of inclement weather you will be offered a refund, reschedule or gift certificate. Shhh…we have ansecret! Our Manatee Fun Houseboat is an awesome semi-private option. You get to enjoy the personal attention of being with a small group but pay just a portion of the price of private tours! Manatee Fun specializes in accommodating less than 6 passengers per vessel, and that can make a huge difference when it comes to the quality of your encounter. As one of the cleanest, most stylish vessels on King’s Bay, you’ll be the envy of other visitors who are often times disappointed at the condition of their tour boat. We close the windows and doors on cold days to take the chill off and keep you more comfortable. At Manatee Fun, we care about your experience and our reputation so we strive to go above and beyond! Embark on your journey with a Coast Guard Certified Master Captain and an in water chaperone, educator and photographer. This tour will run three hours from start to finish and everything you will need is included for one price. You will begin at our full-service tour facility, where you will be educated about the animals in a classroom type setting and receive tips for your snorkel tour to make the most of your day. You will be taught the in’s and out’s of ‘passive interaction’ as this ensures that the animals enjoy the experience as much as we do! You will then be suited up and transported to the dock, where your Manatee Fun House Boat will be waiting for you. King’s Bay’s rich estuary will amaze…..birds, fish and wildlife abound! Submerge yourself in the manatee’s world! Finish your adventure by viewing your Guide’s photos back at our facility and be sure to visit our one-of-a-kind gift shop! Our well-informed staff will direct to other local attractions, restaurants and answer of your questions before you are on your way. We guarantee that after you meet our friendly gentle-giants you will never be the same! You won’t forget your adventures here in Crystal River, and chances are - we will see you again! A unique and fun way to enjoy our privileges here in King’s Bay. 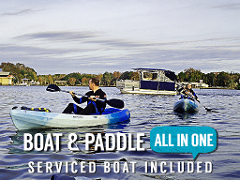 We provide a shuttle boat, experienced Captain and your chosen paddle craft. Snorkel, ride or paddle on; we will find the Manatee and the choice is yours! Viewing manatee from a boat is a beautiful thing, but viewing them from your own paddle craft is an awesome experience! For those of you who would like to swim with Manatee's and combine it with paddling, this is the perfect opportunity. The idea is to have a boat with an experienced Captain to help you locate the Manatee, instead of having to paddle for hours to possibly find them on your own! The shuttle boat will also be close by, so if you’d like a break from paddling then get on the boat and relax! To begin your adventure, you will arrive at our shop and prepare for the Manatee encounter; gear, wet suit and all you need is included in your tour price. You will be transported from our facility to a shuttle boat where your paddle craft and Captain are waiting. You will explore the refuge in capable hands from a safe environment, and disembark on your own kayak or SUP when you are comfortable. You will have the opportunity to snorkel with manatees if you wish, or stay topside and take it all in as you paddle! This is a unique and fun way to view this ecosystem and get up close with these amazing animals, even in the warm months when they can be tougher to find. Pick your poison! Would you like to experience the Wildlife Refuge from a Kayak or maybe try a Stand Up Paddle Board? This tour provides a pilot boat driven by a Master Captain that will act as your guide and instructor increasing your chance of finding wildlife and assisting paddlers on the adventure. Wear your bathing suit...that way you are ready for a quick change into the wetsuit. Bring a towel, most people will bring these along and keep on the boat and apply sunscreen. Keep season and air temps in mind. If it is cooler, it is a great idea to bring a sweatshirt, jacket or even a full set of loose fitting clothing to slip on after you get out of the water. If you have children, this is especially important, be prepared with warm clothes....always better safe than sorry! The water here is always 72 degrees, and for some that is quite chilly! Feel free to bring a bag onboard the boat to keep your personal items, but we HIGHLY recommend not bringing anything of value on board the boat. During warmer weather most people will wear their wetsuits back to the shop and change into their clothes when they return from the trip. Bring what you feel you need, but no worries we will take care of the details! We meet at our full service Manatee Tour and Educational facility in Crystal River. You will be checked in, and offered complimentary coffee, tea or hot cocoa. Upon tour time, we take you into a classroom type setting where we learn about the animals, the eco-system and watch a short video of rules required by the US Fish and Wildlife. This is a wildlife refuge and it is very important that we fully inform you as to what the rules are and how to behave if you hope to view a manatee up close! We will fit you for a wetsuit, direct you to our climate controlled changing rooms and gather up your group. We take care of transporting you the very short drive to the dock, where your Captain and paddlecraft is waiting for you! After your tour, we will drive you back to River Ventures. You can help yourself to coffee and cocoa, use the restrooms and changing rooms, check out the gift shop and view the photos from your adventure! How many people do you take on your manatee paddle tours? order to see an animal. Are there rules we have to follow when we Snorkel with Manatee or paddle near them? How long is the paddle to see the manatee? There is not ‘one spot’ that we go to look for manatee and there is not ‘one area’ that we visit every day, every tour. We go where we can find animals. In the winter time, that may be a short 8 to 12 minute ride to a spring. But in the warmer weather, we may have to look for much longer. Keep in mind when you are paddling, it can be physically demanding and require us to cover a lot of ground especially during the warm weather. In the cold weather we have many in the area and it typically does not take long to find them, but when it gets warm patience and perseverance is a requirement! We always welcome observers and you can often see the manatee from the boat. They sometimes come very close and give you an awesome view! We are only allowed so many passengers on the boats, so an observer does have to pay for that seat. Bring your cameras and binoculars and enjoy the surroundings of the refuge! If you are not a strong swimmer then you must use your own judgment. Are you comfortable in the water with a floatation device? Do you get anxious and upset in the water? We must remain calm and still near the animals, so ‘swimming’ is not as important as being able to relax and float! If someone wishes to ride the boat and not paddle thats fine too, but they will still need to reserve and pay for their seat. Paddle? Swim? Both? How does this work exactly?? So many people have a desire to paddle here on the Refuge waters, they of course almost always hope to see manatee. This tour is designed to keep you close to a highly qualified ‘manatee hunter’ so you have a better chance to find animals from a kayak. When your Captain spots manatee, you will be instructed to QUICKLY AND QUIETLY paddle to the boat, grab your gear and enter the water if you desire to snorkel with the animals. You are always welcome to stay on your paddle craft if you don’t want to get wet! We often refer to this adventure as the ‘Surf and Turf’, because you get a bit of both experiences all in one package! Remember; listen to your Captain to make the most of this experience. Can I go back to the boat if I get tired? The paddle is designed to have you in close proximity to the pilot boat at all times. If you get tired, you can tie up your kayak and hop on the boat. After you swim, you may want to ride the boat back to relax and enjoy the enclosed environment in the cooler months. We always ask that you communicate with your Captain because he or she is responsible for you! Children over 5 years of age are allowed on the group paddle tours, but it is recommended for older kids with at least moderate paddling ability. Children under 18 must be accompanied by an adult, and very young children must understand enough to be calm and quiet in order to not scare the animals away. Children should be comfortable in the water and parents should stay close at all times for safety. We have wetsuits in all sizes and provide snorkel vests and floatation noodles if kids need a bit of assistance staying at the surface without swimming. Rarely do we ever have to cancel because of weather conditions...a little rain doesn’t stop us! Because we are on the coast, storms will often move through quite quickly and even if we delay it will not take away from your tour time. Our boats are covered to protect you and your belongings from the elements if you wish to stay dry. If we need to cancel because of inclement weather you will be offered a refund, reschedule or gift certificate. As a paddle tour, weather can be more of an issue and we try to be flexible. For instance, if there are high winds and paddling would be difficult we would offer the entire group an Endangered Encounter instead of a paddle. If all agree, we would refund the difference between the snorkel and the paddle and still get you out there! We do our best to work with our guests as most come a very long way for this adventure! We require (5) days advance notice if you can not make your scheduled tour reservation. We pre-charge all credit cards to guarantee the seats and we do not process cash refunds for short notice cancellations. This is consistent with an airline, hotel and other swim with manatee tour companies. Our Captains are scheduled according to the number of guests we have any given day, and we appreciate your commitment to be on time and honor your reservation. If you do need to cancel last minute, please contact ASAP and we will offer you gift certificates with no expiration date or a chance at another tour time. Homosassa is famous for one thing……MANATEE!! Join us at our Safaris location to get away from the bustling Crystal River area and enjoy a quieter option at the Blue Waters of the Homosassa head springs. Only Available November - March. Embark on your journey with a Coast Guard Certified Master Captain and a guide that will serve as your in water chaperon, educator and photographer. Your tour will run three hours from start to finish and everything you will need is included for one price. You will begin at our full-service tour facility in Old Homosassa, a quaint fishing village, where you will be educated about the animals and receive tips for your snorkel tour to make the most of your day. You will be taught the in’s and out’s of ‘passive interaction’ as this ensures that the animals enjoy the experience as much as we do! You will then be suited up and your boat is waiting for you at our river-front location, no transport to the dock necessary! Our Coast Guard certified covered pontoon is nicely equipped to take you and your guests in comfort, to find these gentle giants. This rich estuary and tangle of canals will amaze…..birds, fish and wildlife abound! Submerge yourself in the manatee’s world! Finish your adventure by viewing your Guide’s photos back at our facility and be sure to visit our one-of-a-kind gift shop! Jump on one of our Air Boats after lunch to access areas our pontoons can not go or check out the local artisans just next door for locally made, unique gifts! Our well-informed staff will direct to other local attractions, restaurants and answer all of your questions before you are on your way. Join us another day for the manatee experience in Crystal River and receive 10% off if you book both tours at one time. Pontoon boats hold up to 10 people, but the average in homosassa is 7 people on a boat. It is very important to have realistic expectations when it comes to a wild animal encounter! Every trip is different and the experience is unique for each individual. In the cooler weather the animals migrate to this area and congregate here for the protection of the warm water springs; when the weather warms (even during winter months) they can move about going wherever they want! These are wild animals and we can not control their migration. Manatee spend their lives searching for food, mates, sleeping and playing....it is hard to predict what state they will be in when we encounter them. The early mornings tend to be the best time to find the animals and best chance of seeing them near the springs where the water tends to be more clear. Remember it is very simple, cold weather = many manatee; warmer weather=lower manatee counts and more time looking for these endangered animals. Even seeing a few manatee is a phenomenal adventure! Our boats are US Coast Guard Certified, inspected and stability tested for your safety and are designed to hold anywhere between 6 and 16 swimmers and/or observers. Keep in mind that we control the amount of people on our boats, but we can not control the amount of people on the water. We go on a manatee search and all the tour companies go where animals are found......so after 9 am, especially on weekends, Holidays or during manatee season, the waterways can get crowded with people. At 7am you get out while the refuge is at its quietest and the manatee are still in their most relaxed state. We know it’s early....but it tends to be the best experience for our customers so we don’t mind the wake-up call! Our US Coast Guard Licensed Master Captain will accompanied by your in water Chaperone, tour guide and photographer! We take pride in having the best Captains and guides in the business and they go above and beyond to ensure that your group has a safe, pleasant and educational experience. Our in-water chaperones are all Certified Eco-Tour guides through the Manatee Ecotourism Association in conjunction with USFW.....they do not only know how to swim, but they are stewards for these animals and this eco-system, doing their best to stay abreast of all the latest in scientific research. Your Guide will also take photos, from the boat, underwater and all around. These photos are available at the shop after your tour....that way you do not have to worry about your own camera and it’s a great way to take these memories home with you! Our tour price includes everything you need to swim with the manatee! There are no hidden fees or ‘up charges’ for wetsuits, snorkel gear, parking or other unexpected expenses. A picture CD of your tour is optional when you return to River Safaris and you can even view these photos before you decide to purchase them. Our tour price is an AWESOME DEAL for what you receive in return.....most of our customers agree on this! However, we do offer group discounts for 10 or more people. Typical group discounts are 10% savings. We also do combination discounts, meaning that if you book a morning manatee tour and an afternoon airboat we will offer you a discount. Custom packages are available for large groups, just call or email for details. If you are a Veteran, we offer thanks for your service by extending a 10% discount for your tour, just ask BEFORE BOOKING for any of these programs. This 4 hour tour is perfect for your small group! Our cozy houseboat seats up to 6 guests, is fully enclosed, and heated with a bathroom. Join us at our Safaris location to get away from the bustling Crystal River area! Available Nov-March. Enjoy a high-end experience, with an affordable price tag! Our luxury pontoon aims to amp up the manatee encounter and deliver a more personal event! 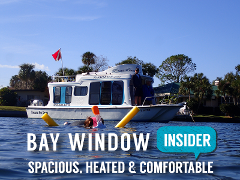 This boat is enclosed, heated, includes snacks & beverages and runs 4 hours! 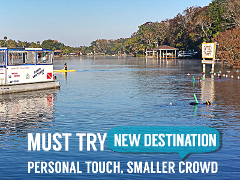 Enjoy the unique privilege that is exclusively ours here in Citrus County Florida by swimming with the manatees in the spring-fed Homosassa River! Citrus County is home to the world’s largest population of the protected manatee during the winter season, and the 'Blue Waters' of the Homosassa Spring offer an awesome opportunity for viewing. Having the chance to encounter these curious, gentle giants in their natural habitat is an adventure that your family will never forget! Embark on your journey with a Coast Guard Certified Master Captain and an in-water chaperone, educator and photographer. Your tour will run four hours from start to finish and everything you will need is included for one price. You will begin at our full-service tour facility, where we suit you up in wet suits and introduce you to your guides. On board your vessel, while headed to the springs we ensure you understand the rules of engagement, watch an instructional video and receive tips for your snorkel tour to make the most of your day. You will be taught the in’s and out’s of ‘passive interaction’ as this ensures that the animals enjoy the experience as much as we do! This rich estuary will amaze…..birds, fish and wildlife abound! Submerge yourself in the manatee’s world! Finish your adventure by viewing your guide’s photos back at our facility and be sure to visit our one-of-a-kind gift shop! Our well-informed staff will direct to other local attractions, restaurants and answer all of your questions before you are on your way. We guarantee that after you meet our friendly gentle-giants you will never be the same! You will never forget your adventures here in Homosassa, and chances are - we will see you again! Be treated like royalty on our Luxury Pontoon and see the River in style! This semi-private pontoon seats up to six and offers you a comfortable, more personalized 4 hour excursion! The heat may not get to the temperature of your living room, but it takes the chill off and that definitely helps everyone have a great time! This is a very common question and we do our best to advise honestly and completely. We only run manatee tours in Homosassa during the winter, though we typically can find at least a few manatees in the Crystal River all summer long. You may find a tour company to take you out in the summer to explore the Homosassa; but we strive for the best experience possible and hate to have disappointed visitors! 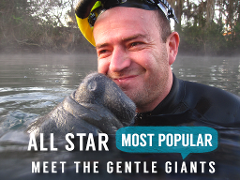 Manatees may be more plentiful in Crystal River; however, so are the humans! Crystal River can get crowded and often times people are surprised at the man-made canals, businesses and residential areas that surround the springs. Homosassa tends to be more quiet, less crowded (busy on weekends) and has a more natural setting. Crystal River has dozens of springs so the manatees spread out throughout the Bay; but in Homosassa there is one head spring where the animals congregate when it's cold. Once it is warm, there are virtually no manatees to be found in Homosassa. When in doubt, call for an update on conditions! Wear your bathing suit...that way you are ready for a quick change into the wetsuit. Bring a towel, most people will bring these along on the boat. Keep season and air temps in mind. If it is cooler, it is a great idea to bring a sweatshirt, jacket or even a full set of loose fitting clothing to slip on after you get out of the water. If you have young children, this is especially important, be prepared with warm clothes....always better safe than sorry! The pontoon is enclosed, but being prepared for the elements is important. Warm clothes, hat, sunscreen, etc. The water here is always 72 degrees, and for some that is quite chilly! Feel free to bring a bag onboard the boat to keep your personal items, but we HIGHLY recommend not bringing anything of value on board the boat. During warmer weather most people will wear their wetsuits back to the shop and change into their clothes when they return from the trip. Bring what you feel you need, but no worries we will take care of the details! On the VIP we provide you with bottled water and other assorted beverages, but you are welcome to bring whatever else you would like! The semi-private VIP tour is a 4 hour adventure from start to finish. IT IS MOST IMPORTANT THAT YOU ARRIVE NO LATER THAN YOUR SCHEDULED TOUR TIME!! Our boats operate on a schedule ....and it can be very difficult to deviate from that for a late party. Don’t miss the boat.....please arrive on time! Yes, we provide a US Coast Guard Licensed Master Captain AND an in water Chaperone, tour guide and photographer! We take pride in having the best Captains and guides in the business and they go above and beyond to ensure that your group has a safe, pleasant and educational experience. Our Guides and Captains are all Certified Eco-Tour guides through the Manatee Ecotourism Association in conjunction with USFW.....they do not only know how to drive a boat, but they are stewards for these animals and this eco-system, doing their best to stay abreast of all the latest in scientific research. They will ‘model’ the proper behavior to assure that the manatee are treated with the utmost respect......this is their house, we are just the visitors! Your guide will also take photos, from the boat, underwater and all around. These photos are available at the shop after your tour....that way you do not have to worry about your own camera and it’s a great way to take these memories home with you! Absolutely! Manatees are protected under the Endangered Species Act and it is quite a privilege that we get to have this sort of encounter! Both the State and Federal Government oversee the protection of these animals and the guidelines get stricter every year. These laws are in place to help protect the animals and they will be enforced here in the Wildlife Refuge, people can be ticketed, fined and removed from the water if behavior is deemed inappropriate or illegal. When you arrive for your tour we will cover all the dos and don’ts so you are fully informed before you hit the water! Please remember that manatees are a protected and threatened species and seeing even one of these majestic beasts is a great privilege. Our tours are conducted in their natural habitat and they are free to come and go as they please. No two days are ever the same, and no two tour times are the same either. Weather, tidal influences and time of the year affect the conditions daily and it can never be predicted just how many manatees you will see. During the colder months we have a large concentration, but if there is a considerable warm spell they will become difficult to find. We never guarantee that you will find or encounter manatee and how many you see is tough for us to predict as well. We always welcome observers and you can often see the manatee from the boat. They sometimes come very close and give you an awesome view! We are only allowed so many passengers on the boats, so an observer does have to pay for that seat. Bring your cameras and binoculars and enjoy the surroundings of the refuge! If you are not a strong swimmer then you must use your own judgment. Are you comfortable in the water with a flotation device? Do you get anxious and upset in the water? We must remain calm and still near the animals, so ‘swimming’ is not as important as being able to relax and float! Rarely do we ever have to cancel because of weather conditions...a little rain doesn’t stop us! Because we are on the coast, storms will often move through quite quickly and even if we delay it will not take away from your tour time. If we need to cancel because of inclement weather you will be offered a refund, reschedule or gift certificate. We require (5) days advance notice if you can not make your scheduled tour reservation. We charge all credit cards when you make your reservation to guarantee the seats and we do not process cash refunds for short notice cancellations. This is consistent with an airline, hotel and other swim with manatee tour companies. Our Captains are scheduled according to the number of guests we have any given day, and we appreciate your commitment to be on time and honor your reservation. If you do need to cancel last minute, please contact as ASAP and we will offer you gift certificates with no expiration date or a chance at another tour time.